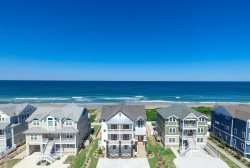 Discover one of the Outer Banks’ most coveted destinations – the Town of Nags Head – while being surrounded with ways to have summer fun at the bright and sunny Summer Fun II. This 4 bedroom beach retreat that’s located approximately 1975’ ft. away from a public beach access is brimming with little touches and amenities to make life at the beach a pleasure throughout an OBX vacation. Start a vacation off right with a splash in the private pool, a dip in the adjacent poolside hot tub, or a family barbecue courtesy of the pergola with picnic table and two grills. Inside, the fun keeps going in the game room with Bubble Hockey & Shuffleboard, refrigerator, and TV / DVD, and guests can also take a break from the action in one of four bedrooms – a bedroom with twin beds on the ground level, and three sunny bedrooms that border a den in the quiet top level. For grand family gatherings, guests will want to meet in the middle, where the second level welcomes guests with a living area with fireplace and 47” flat screen TV, a dining and kitchen area, and a spacious covered deck. From sprawling views of the neighborhood to bright furnishings throughout, Summer Fun II is a sunny retreat that will have everyone grinning. From the surrounding restaurants, shops, and activities to the ample diversions and places to relax found at home, Summer Fun II is perfectly suited for endless entertainment. Soak up the Summer Fun of the Outer Banks lifestyle, and book your stay at this breezy retreat today.